Today we publish the single departmental plans which I blogged on last July. The plans identify objectives and priorities for each department, together with the outputs and resources available to achieve them. They put the ‘what’ and the ‘how’ together in a single document for the first time in Whitehall. This is particularly important in the current context. The Civil Service reduced by about 15% over the last Parliament, and that broad direction of travel will continue over the coming years. This will force us to be increasingly aware of what can and can’t be achieved; what our real priorities for delivery are, and hence where we should focus our resources. We have an enormous and important task - to deliver ambitious manifesto commitments and business as normal with increasingly constrained resources. To achieve this, we cannot continue to work in the way that we have in the past. We must continue to improve the services we provide for the public, while at the same time find more efficient ways to deliver them. We must embrace the transformations, which are embedded within the plans. As I go around the country talking with civil servants, people are excited about that future, and the SDPs contain the actions that will make it a reality. It means breaking down some of the barriers which constrain how we work today, delivering new technology to enable the front line services to be better, and sharing buildings - to mention just a few examples. The world will change, and we have to adapt to it. We will therefore need annually to update the SDPs. Departments will track their progress against the plan through the year for their own Executive Committees and Boards. The plans are a public statement of what we want to achieve - so they must be focussed on the right things, and we will hold ourselves to account for their delivery. So please make it your mission to understand where you, and your team, fit into these plans, and if it’s unclear, ask your leaders to clarify. These plans are by the Civil Service, for the Civil Service. They are our opportunity to get on the front foot and shape our destiny - and every one of us must be a part of it. Welcome the public statement of what the Civil Service wants to achieve, but little detail of how the Civil Service will publish progress against the plan. And no mention of previous strategies/plans and performance against those. "As I go around the country talking with civil servants, people are excited about that future"
I'll take your word for it. When I look around me I see committed people being worn down by challenging conditions and the uncertainty of the future. oh guess what a further reduction of staff - what a surprise and I would guess those left will have still more work to do. that will be a challenge ! "They are our opportunity to get on the front foot and shape our destiny - and every one of us must be a part of it." Except every one of us won't be a part of it as thousands of our jobs are axed over the next few years. I try to remain positive, but it feels like a struggle sometimes. I used to really enjoy coming to work, but with the erosion of pay and conditions and the lack of real opportunities in some areas seems to make it harder each month. I'm not going to bang on about pay, PMR, etc, as we all know the issues with those. 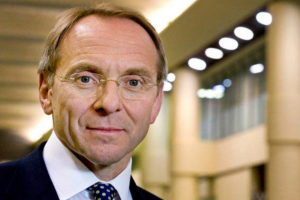 as for "As I go around the country talking with civil servants, people are excited about that future", I guess it depends which civil servants John Manzoni has been speaking with. My wife is not particularly 'excited' about her future with HMRC, given that her office is being closed as part of that groups restructuring, and she will now have a very long, difficult commute to work - as well as much more expensive - all on an EO's salary, just to retain her employment. Her pension changes also mean an age 67 retirement age on a pension (by that time) that she has no idea how much it will be worth. So, no, I wouldn't say 'excited about the future' is particularly accurate. Meanwhile, head of HMRC, now a Dame, retires on a 6 figure pension - even though, in front of a Commons Select hearing, she states she is not a 'tax expert'. Which is a real issue - my wife, and her colleagues, are 'experts' - they are the ones who obtain tax revenue from businesses & individuals who do their utmost to avoid payment - but the staff have poor salaries (how about a % bonus of the tax they collect? No, I didn't think so...) poor working conditions, PMR, long commutes to work - and a small pension at some distant stage. It's not fair really, is it? I have always thought that each area like Brighton County court should be given the chance to be trustes and the people of the area's could then play a much stronger part in the justice system ( democracy ). The trustes should then decide on staff levels and it will be up to the trustes to decide what percentage of the budget in that way. Also the trustes should recruit and promote the best way they think best. This means no longer waiting 6 months for new staff. The "Barriers that constrain the way we work" are actually the safeguards that protect the civil servant's family life and ensure some measure of Work/Life balance for the employee. Excited about the future? I'm devastated. In future, the Civil Service will be smaller and will require greater flexibility from staff. People will need to be upskilled and that means investment in training and L&D. But the future is uncertain and as a leader it's important to acknowledge this uncertainty. To say that people are excited about the future doesn't acknowledge the fear that people feel about the future. As a leader managing change, it's critical to be open and honest. I hope the above comments demonstrate the importance of good communication. With an ever decreasing Civil Service why is it necessary to have both a CEO as well as a head of the Civil Service, so before continuing to reduce frontline staff, continuing to cut their pay and conditions, it would be good to see some Leadership on this at the top. And continues, “one reason why those junior jobs go is because frequently you just stop doing something, or you automate it. And when you automate something, in general it’s junior jobs that go more than senior ones”. Personally, I can’t figure who is actually going to be able to implement the changes that the SCS devise if the junior posts keep getting cuts and the remaining staff so demotivated. Haha. This is incredible: 'Departments will track their progress against the plan through the year for their own Executive Committees and Boards'! Self measurement, self regulation and self reporting. Seriously John, do you expect any Department to say they are not meeting the plan? Which they themselves have set anyway! They will put a spin on it no matter how bad the progress is. You need some independent assessment that reports directly to yourself (or someone important), or the whole idea becomes devalued. People at the top cannot resist using words of exaggerated enthusiasm when sending out their constant stream of positivity about every new direction, every challenge, every minor achievement, every new appointment etc etc ad infinitum. They seem to think that constant use of "excited", "thrilled", delighted" and so on will enthuse the rest of us and stir us to rise up and follow with dynamism and fervour. In reality, it's just downright irritating and off-putting to be bombarded with such limited and predictable epithets. It won't be a wonderful world just by keeping on saying so. De-regulation and de-centralisation, worked for the dot-com bubble in the 2000's; banking in the 1990's; shares dealing in the 1920s and the railway company share price collapse in the 1840's. I do not know anyone who is excited. So, when is the date for privitisation? It is where we are going, isn't it?